Edward Burne-Jones (1833 – 98) was one of the most significant British artists of 19th century and a leading figure in the Pre-Raphaelite Brotherhood. Myths and fairy tales weave throughout much of his art, including his exquisite ‘Briar Rose’ series. This famous narrative is central to a major exhibition opening at Tate Britain this autumn, ‘Edward Burne-Jones: Pre-Raphaelite Visionary’ (24 October – 24 February). I wanted to find out a bit more about this artist, originally from Birmingham. Burne-Jones was born and brought up in Birmingham. His father was a frame maker on Bennetts Hill, where you can find a blue plaque commemorating the painter’s childhood. And the JD Wetherspoon pub and hotel on Bennetts Hill is called the Briar Rose, after the artist’s famous series. Impress your friends with some art history next time you pull up for a pint? Burne-Jones attended King Edward’s School in Edgbaston, where he developed a love of classical mythology, ancient civilisations, poetry and art. He also studied at Birmingham School of Art from 1848 to 1852. The artist’s upbringing in Birmingham had a profound and lasting impact on him. He rejected the Victorian industrial ideals and increased focus on materiality. Instead, he used his art to create an alternative existence of enchantment, myth, spirituality and beauty. Leaving Birmingham behind, Burne-Jones went to study theology at the University of Oxford. Here he became close friends with William Morris: together they pioneered the arts and crafts movement. The two men discovered a shared love of literature and interest in romanticism, mythology, fairy tales and legends. “There are two arts which others don’t care for that Mr Morris and I have found our greatest delight in – painted books and beautiful tapestry” – Edward Burne-Jones. Abandoning earlier ideas to join the church, together with a small group of Burne-Jones’ friends from Birmingham, known as the Birmingham Set, they formed a close and intimate society, which they called “The Brotherhood”. Members read John Ruskin and Tennyson, visited churches and the local countryside, and revered the Middle Ages. This early interest in myth, fairy tale and legend continued throughout Burne-Jones’ career, culminating in his Sleeping Beauty series, entitled ‘The Legend of Briar Rose’. Completed between 1885 and 1890, four large-scale paintings – ‘The Briar Wood’, ‘The Council Chamber’, ‘The Garden Court’ and ‘The Rose Bower’ – are almost 3 metres long. They are complemented by an additional ten adjoining panels, telling the tale in exquisite detail. The paintings were bought by Alexander Henderson, later 1st Lord Faringdon, and installed in Buscot Park, Oxfordshire. Today a National Trust property, you can find the works hanging in the music room, in frames inscribed with verses written by William Morris. The artist’s attraction to Charles Perrault’s story of the Briar Rose, also told by Tennyson in his 1842 poem Day Dream, began as early as 1864. He created a small series of tiles for Morris & Co. (now in the Victoria & Albert Museum) for a client’s house. From there, he made a number of dreamlike studies in watercolour and gouache, several of which you can find at Birmingham Museum & Art Gallery. A small series of oil paintings followed, and then the larger set of 4 oils, finished in 1890. The Briar Rose paintings illustrate the princess and her court frozen in time in a medieval dream world. The artist modelled Sleeping Beauty on his daughter, Margaret. Burne-Jones chose to focus on a single moment from the famous story – when the brave prince, having battle through the briar wood, first comes upon the bewitched court of sleeping knights, attendants and the princess he is to awake with a kiss. 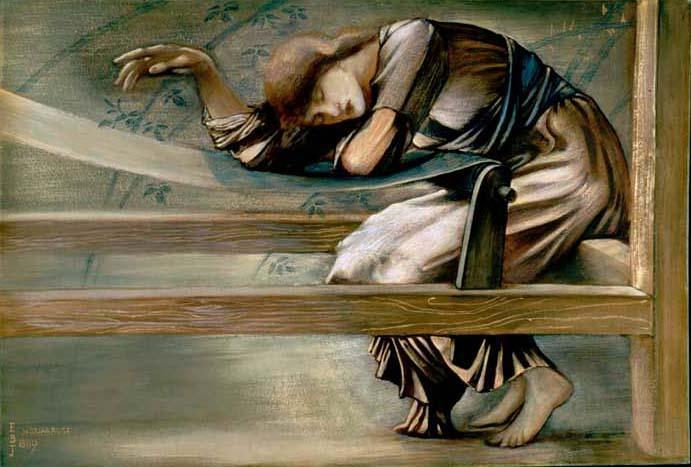 Burne-Jones carefully composed the series so that the eye passes naturally from the prince standing on the left in the first scene to the object of his quest, the sleeping princess, on the right of the final canvas. Yet there is no narrative progression in the cycle, as time stands still amidst enchantment and silence. Burne-Jones has told the story beautifully, evoking its associations with sexual desire, awakening and the coming of age theme. For the major exhibition coming to Tate Britain, Burne-Jones’ Sleeping Beauty series will be loaned from Buscot Park. The show will bring together over 150 works in different media including painting, stained glass and tapestry, including the artist’s action-packed story of Perseus from classical mythology. Hopefully, it will reassert Birmingham’s Burne-Jones as one of the most influential British artists of the 19th century and raise the profile of the Pre-Raphaelites who seem to have fallen out of fashion in the art market. Did you know that Birmingham Museum and Art Gallery has the largest collection of works by Burne-Jones in the world? It houses the massive watercolour Star of Bethlehem, commissioned for the Gallery in 1897, and several studies for the Briar Rose series. His paintings are believed to have influenced the young J. R. R. Tolkien, who also grew up in Birmingham. Burne-Jones was closely involved in the rejuvenation of the tradition of stained glass art in Britain. In Birmingham you can see stunning examples of his stained-glass designs in the windows of St. Philip’s Cathedral and St Martin in the Bull Ring. Want to read more about the Pre-Raphaelite artists? Head over to my earlier blog post on the group, including how they got their name. I can also recommend Fiona MacCarthy’s beautifully written book ‘The Last Pre-Raphaelite: Edward Burne-Jones and the Victorian Imagination’.